Sauk Centre emergency response needs response from the community; with multiple positions open, both the Sauk Centre Fire Department and the Sauk Centre Ambulance Service are looking for volunteers who will respond to crises in the community. 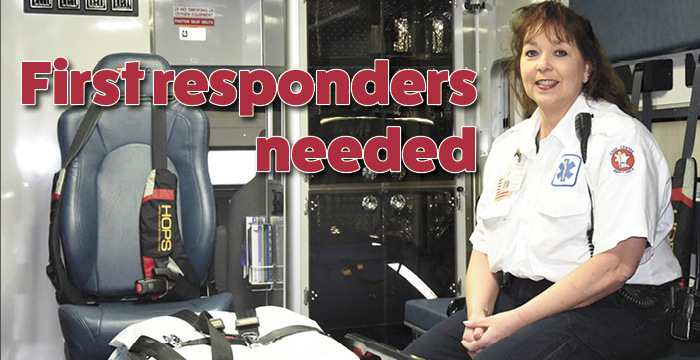 The application deadline for the fire department is noon Friday, April 12, while the ambulance service’s deadline for Emergency Medical Technicians is 4:30 p.m. Monday, April 15. With 29 out of 30 possible volunteers, the fire department has had a position open for a couple of years. However, with two firemen retiring – Mark Sprengeler and Mark Roberg – the department now has three open positions that need volunteers. “There’s going to be an interview and a physical test, and then we’ll create a list from that and decide who we want to hire,” said Steve Moritz, fire chief for the Sauk Centre Fire Department. The ambulance service is also looking for a couple of volunteers to help reinforce their service. Even though they have three ambulance rigs at their disposal, the ambulance service often does not have the staffing for all three. When a crew goes out, sometimes they do not have a backup crew to cover for them. The ambulance service is looking for people who want to serve their community and be there when their neighbors, friends and family need help. Flexibility with their hours is also a desirable quality. “They also need to have the flexibility to take calls on weekends and be backup on weekends and holidays as well,” Struffert said. The fire department looks for similar flexibility and stability in their candidates. Accepted applicants for both departments will have to go through extensive training to prepare them for their role. Ben Clink, supervisor for Sauk Centre Public Works, has been a member of the fire department for seven years and completed his EMT certification for the ambulance service in January 2018. Training for the fire department involves 160 hours in the first year. One of the most important steps is the class taken through Alexandria Technical College or Ridgewater College in Willmar. The classes teach volunteers about basic firefighting, extrication, equipment and other firefighting subjects; book learning is combined with physical training, with practical tests after every book chapter test. EMTs for the ambulance service have 140 hours of training to complete, including CPR training and attending a class three days a week for about two months at the St. Cloud Vocational Technical Institute. The class teaches volunteers through a textbook and workbook as well as assignments to complete during the week, going over topics about human anatomy and injuries. Along with the class, EMT volunteers also experience real-life situations such as ride-a-longs with the ambulance crew and following a nurse in a hospital setting. The experiences help volunteers learn the medical lingo and procedures such as taking blood pressure. In Clink’s experience, volunteers have to be dedicated and committed to success with the departments; sometimes that means being called away from family events, ready to go at a minute’s notice. However, it is a service he recommends.